Hamilton, Bermuda (AP) — Emirates Team New Zealand’s Peter Burling wheeled his 50-foot catamaran into controlling position in the prestart of Race 8 of the America’s Cup and then gave a quick wave with his right hand to Jimmy Spithill and the boys on Oracle Team USA. Burling said later he was merely pleased that he nailed the maneuver that allowed the Kiwis to sail away to their second win Sunday on the Great Sound and reach match point in sailing’s marquee regatta at 6-1. Burling, though, is one cool cat at age 26, an Olympic gold and silver medalist steering a crazy fast cat. Perhaps looking to one-up Spithill in gamesmanship, Burling might as well have been waving goodbye to two-time defending champion Oracle Team USA, which is owned by software tycoon Larry Ellison and crewed mostly by Australians. The Kiwis need one more win to humble Ellison’s squad and reclaim the oldest trophy in international sports for the Royal New Zealand Yacht Squadron in Auckland, which held it from 1995-2003. The clincher could come Monday, when two races are scheduled. New Zealand, a small, sailing-mad island nation, will no doubt be holding its breath. Kiwi fans who have been getting up at 5 a.m. Down Under to watch the races on TV remember the soul-crushing collapse in 2013. Team New Zealand, then led by Dean Barker, reached match point at 8-1 only to let Oracle win eight straight races to complete one of the greatest comebacks in sports to keep the Auld Mug. This seems to be a different Kiwi crew. After splitting Saturday’s two races, Spithill piled on the Kiwis. He noted that the New Zealanders had taken a few days off during a five-day break while Oracle hit it hard, on the water and in the boat shed. He said the Kiwis had benefited from some “soft” calls by the umpires. The Kiwis answered Sunday by winning Race 7 by 12 seconds and Race 8 by 30 seconds. 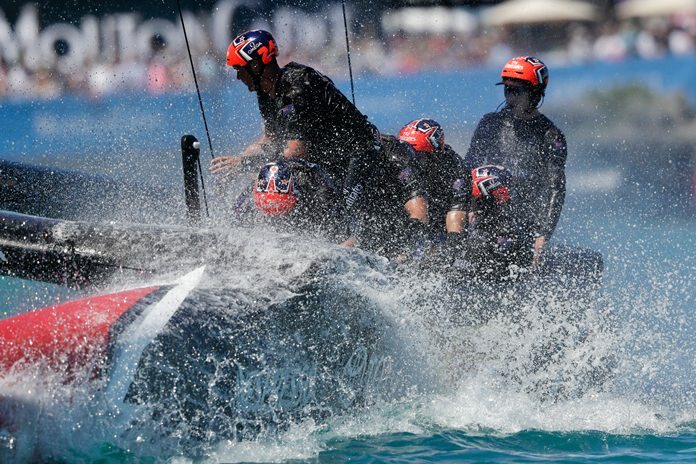 Team New Zealand has won seven races but began with a negative point because Oracle won the qualifiers. Spithill said the powerhouse American-flagged crew — backed by technology from Oracle Corp. and Airbus — continues to make too many mistakes. He said he and tactician Tom Slingsby, a fellow Aussie, will decide if there will be any crew changes for Monday. In 2010, Spithill became the youngest skipper to win the America’s Cup, at age 30. Now Burling could become the youngest helmsman to hoist sailing’s greatest prize. While Burling steers the boat, the crew is skippered by Australian Glenn Ashby, 39, a multihull wiz who controls the giant wingsail, which performs just like an airplane wing. Underfunded Team New Zealand almost folded after the 2013 debacle, but has bounced back with a remarkably fast boat design that includes a radical cycling grinding system, and spot on crew maneuvers. At the start of Race 8, Burling wheeled underneath and then alongside Oracle, forcing the U.S. boat to slow. Burling then hit the line and kept his catamaran on foils all the way around the course as he sailed to the cusp of what would be an enormous upset. In Race 7, Spithill turned up just a little bit as the catamarans approached the starting line, perhaps fearful of being early across the line as he was in Races 1 and 5, both losses. He said those mistakes were due to a software glitch on the space-age boat. That’s all Burling needed to put his cat ahead for good. Team New Zealand first won the America’s Cup in 1995 when Russell Coutts — now the CEO of Oracle Team USA — skippered a five-race sweep of Dennis Conner off San Diego.